You know how sometimes, you luck up on one of those little gem of a cafe? This is one! We stopped at the Al Barsha Mall here in Dubai to go to the Union Coop for salted almonds. TBG swears that they’re the best ones in town, freshest and saltiest. And, we were both hungry, since lunch had been many hours earlier. 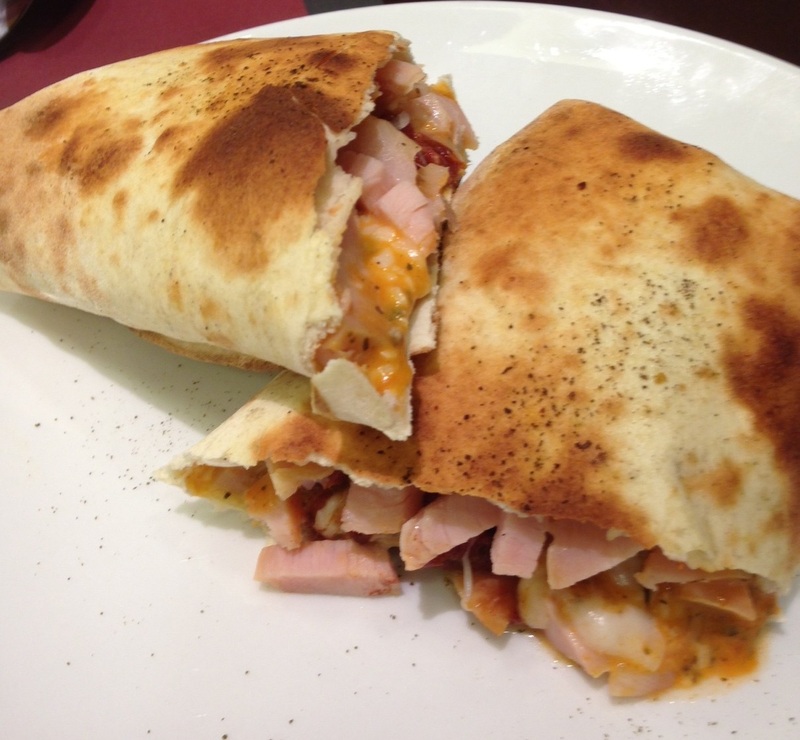 I checked The Entertainer books to see if they had vouchers for anyplace in this mall and they did, Sandella’s Flatbread Cafe http://www.sandellas.com. Buy one, get one free entrees. Yanked that one right out of the book and off we went! We were the only ones in the place, of course, it *was* 9 pm after all. 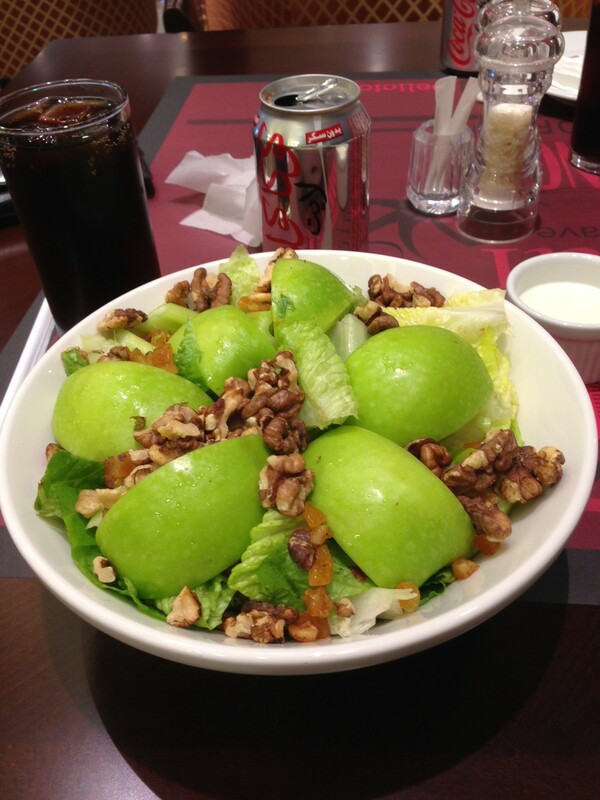 And, there’s a Lebanese cafe that shares the space with Sandella’s, it’s called Abela & Co. http://www.abelaandco.com We ordered the Apple, Celery and Walnut salad AED24 (Romaine, walnuts, apple, celery, orange peel with a citrus yogurt and mayo dressing) and the Turkey and Mozzarella Panini AED27 (Smoked turkey breast, mozzarella cheese, sun-dried tomatoes, red pepper basil sauce topped with fresh basil leaves in their flatbread). While we were waiting for our food, I noticed that the server there was very attentive without being annoying, a rare find at local eateries. He placed our dishes without fanfare or clatter, and removed papers, wrappers, quickly but not obtrusively. Does that make sense?? Anyway, while waiting, I decided to check out the display case of foods on the Lebanese side and see if I could identify any of the dishes on display to their menu. I could not. But the server walked up to me and asked if he could help – I told him I was new to Lebanese foods, and wanted to learn what these were. At that point, he graciously matched back each of the items on display to the menu, explained what they were, preparation if it was unusual, and any interesting information about them, like the group of Cold Mezzeh (snacks) and Hot Mezzeh were plenty for two, and the Platter would serve 4 easily. 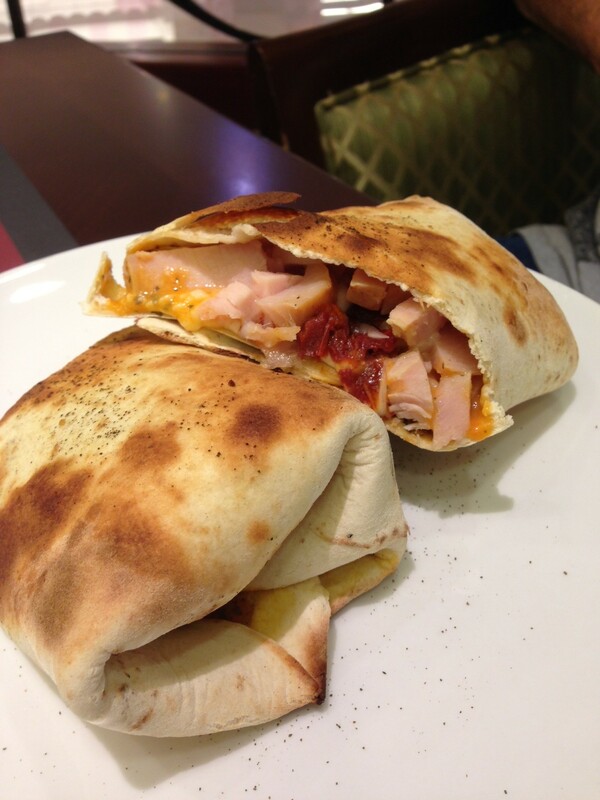 TBG’s panini looked yummylicious….. fresh, wonderful looking flatbread, and chock full of chickeny-goodness and greens. And HUGE. Really. I thought for sure he’d be taking half of it home for my lunch the next day (hoping). Didn’t happen, he pronounced it “Great” and offered me a bite. Flatbread was crispy outside, but soft inside, a welcome distinction from most thin pliable flatbreads I’ve eaten. Chicken was moist, well-seasoned for the average taste – a bit on the “hot” side for me, but I’m a wimp when it comes to hot things. Plenty of cheese, and a nice balance of pesto sauce to meat/cheese. Not a morsel remained on his plate. Well… hello apples!! Great combination of crispy tart granny smith apples and savory roasted walnuts. The candied citrus peel was a pleasant find in there, too – I’m a big fan of fruit in my salads. I had some doubt about the citrus-yogurt dressing, and had asked for it on the side in case I hated it….lol. It was light, more yogurt than mayo, and barely citrusy at all. OK, but I would have enjoyed a bit more citrus taste in it as well. HUGE serving here as well, and I did end up taking about half of it home with me. Very tasty and I’d order it again. We also ordered a Family Style Italian Salad (2-3 servings, mixed greens, tomato, olives, cucumber, capsicum and carrot with italian dressing) to takeaway for lunch the next day. TBG had bought this salad in the past and enjoyed it tremendously, so this was a “known” food to him. 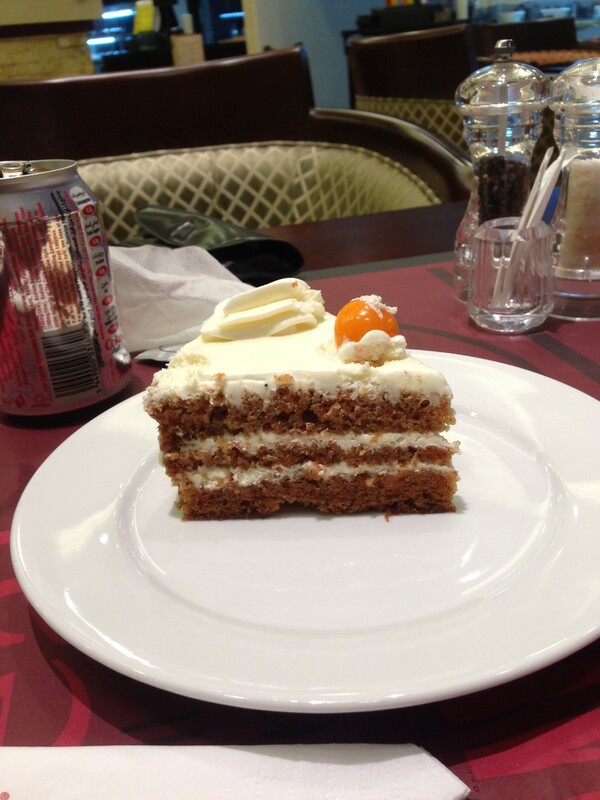 As we finished our meal, the server arrived with a slice of carrot cake and two forks (man after my own heart!) compliments of the house. He said it was their specialty and was really tasty. Lovely, isn’t it? I asked what the small orange thing was on top, and he told me the name, but I’ve forgotten. It’s a fruit, sweet, reminds me of an orange kiwi taste, and texture of a grape but looked like a tomatoe inside. Interesting, and I’ll look for them. 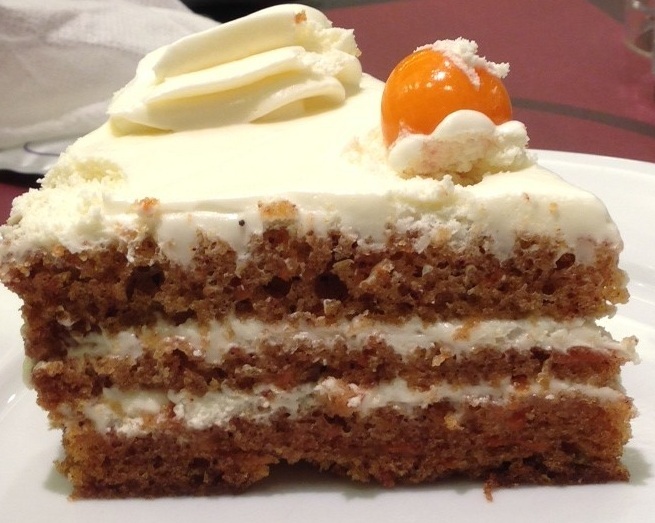 The cake layers were surprisingly tender and moist, with lovely bits of grated carrot distributed throughout. Well-spiced, with nothing too exotic to overpower any other one, just a really enjoyable cake. But that frosting….. man. I’m a big fan of cream cheese frosting, but it can sometimes be REALLY too much, thick and gooey and just covers up whatever it’s on… but not this. Light, almost a whipped texture, smooth as silk, and not too sweet – tremendous. Truly. The server asked if we were enjoying it, and between mouthfuls and calculating if there were still bites left for me, I told him “Very much, do you make it here? ?” He said no, that it was made in their central bakery just a few miles away. That is *exactly* it, Dana, thank you so much for the information and the link……. interesting that they grow inside a husk somewhat like a tomatilla! I appreciate the input, and hope you enjoy following along on my adventure here! I’ve come across them when traveling too but I don’t see them often enough to ever remember what they are. I have to look it up every time.